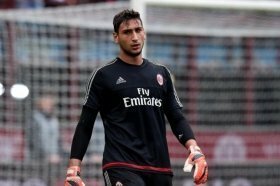 Gianluigi Donnarumma this season has broken into AC Milan's first team as their goalkeeper of choice and there are rumours that the talented 17-year-old could be headed to Euro 2016 this summer. Despite being just 17-years-old, the goalkeeper has proven himself in Serie A already and has appeared for Italian youth international teams since the tender age of 14. Former AC Milan coach Sinisa Mihajlovic insisted that Donnarumma be promoted to the first team and quickly took the place of Diego Lopez and Christian Abbiati in the starting line up. Making his debut in October 2015, Donnarumma has since gone from strength to strength. Even Milan goalkeeper Diego Lopez told the press that the 6 foot 5 keeper is the future of Italian football. Legendary keeper Christian Abbiati has since praised Donnarumma's "god-given talent" as the keeper shows week in week out that he is one of the best young keeper's in world football. It is widely expected that Gianluigi Buffon will retire from international football after Euro 2016, making way for the young Donnarumma to take his place. A perfect transition, some are already saying. What makes Donnarumma so incredible is that he uses his size so well. Agile, quick and with incredible reflexes; combined with decision making that even a 27-year-old professional keeper would be lucky to own; let alone a 17-year-old. The future is very bright for this shot stopper. Expect big things for many years to come.